Great apps come from great teams. Manage teams and people, get fine-grained control with app-level permissions and use collaboration tools like Heroku Pipelines to define your software delivery process - all with delegated administration and centralized billing. Assign users permissions based on their roles, whether they’re team members or admins, to enable collaboration and delegated administration. Get fine-grained control with app-level permissions and the ability to lock sensitive apps. Easily add new members to all of your team’s projects. We've optimized Heroku Flow to make it even easier for teams to embrace continuous delivery. 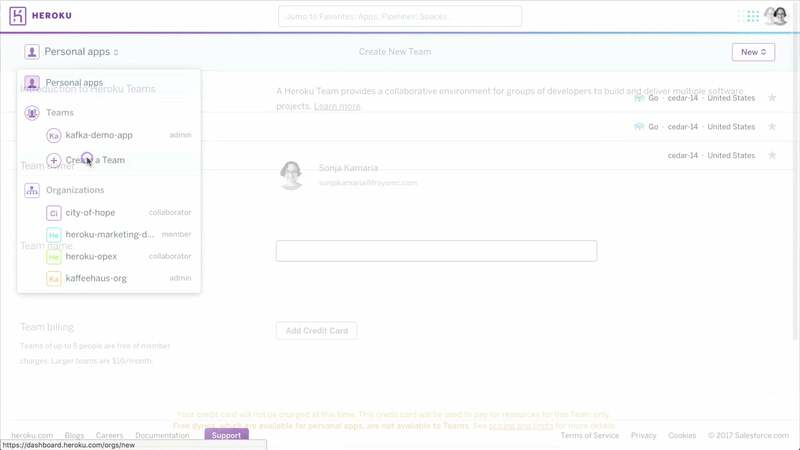 Team member roles and permissions automatically apply to review apps and team-owned apps in Heroku Pipelines, enabling more frequent, higher quality releases. As your business grows gain clarity and better manage your costs across all your apps, add-ons, and resources with one convenient bill. Free for 1-5 users, then it’s just $10 per month for up to 25 users. Need a higher level of governance and control? Learn more about Heroku Enterprise. Heroku Teams gives our developers what they need to get their job done without any roadblocks. It also gives us simplified and centralized cost control to keep the accountants happy and make our lives easier. Heroku Teams is great for managing a small team. It makes it easy for our developers to collaborate on building apps and lets us manage our billing from one simple interface.